Note: as I mentioned in the previous post, starting with aaa is not always the recommended approach since analysis is very complicated process. I wrote more about it in this answer — read it to better understand why. Now let’s enter the Visual Graph Mode by pressing VV. As explained in the first part, you can toggle views using p and P, move Left/Down/Up/Right using h/j/k/l respectively and jump to a function using g and the key shown next to the jump call (e.g gd). We can see that the user input [arg_8h] is copied to a buffer ([local_88h]) and then, just as we saw in the previous post, the string Megabeets is encrypted with rot13 and the result is then compared with our input. We saw that before so I won’t explain it further. Did you see something fishy? The size of our input is never checked and the input copied as-is to the buffer. That mean that if we’ll enter an input that is bigger then the size of the buffer, we’ll cause a buffer overflow and smash the stack. Ta-Dahm! We found our vulnerability. Now that we have found the vulnerable function, we need to gently craft a payload to exploit it. Our goal is simply to get a shell on the system. First, we need to validate that there’s indeed a vulnerable function and then, we’ll find the offset at which our payload is overriding the stack. We know that our binary is taking user input via stdin, instead of copy-pate our input to the shell, we’ll use one more tool from radare’s toolset called rarun2. rarun2 is used as a launcher for running programs with different environments, arguments, permissions, directories and overrides the default file descriptors (e.g. stdin). It is useful when you have to run a program using long arguments, pass a lot of data to stdin or things like that, which is usually the case for exploiting a binary. — Use rarun2 to launch your programs with a predefined environment. We executed our binary and passed the content of pattern.txt to stdin with rarun2 and received SIGSEV 11. Did you notice that now our prompt points to 0x41417641? This is an invalid address which represents ‘AvAA’ (asciim little-endian), a fragment from our pattern. radare allows us to find the offset of a given value in De Bruijn pattern. Now that we know that the override of the return address occurs after 140 bytes, we can begin crafting our payload. As I wrote a couple times before, this post isn’t about teaching basics of exploitation, it aims to show how radare2 can be used for binary exploitation using variety of commands and tools in the framework. Thus, this time I won’t get deeper into each part of our exploit. Our goal is to spawn a shell on the running system. There are many ways to go about it, especially in such a vulnerable binary as ours. In order to understand what we can do, we first need to understand what we can’t do. Our machine is protected with ASLR so we can’t predict the address where libc will be loaded in memory. Farewell ret2libc. In addition, our binary is protected with NX, that means that the stack is not executable so we can’t just put a shellcode on the stack and jump to it. Although these protections prevents us from using a few exploitation techniques, they are not immune and we can easily craft a payload to bypass them. To assemble our exploit we need to take a more careful look at the libraries and functions that the binary offers us. — You haxor! Me jane? il stands for Information libraries and shows us the libraries that our binary uses. Only one library in our case — our beloved libc. Oh sweet! We have puts and scanf, we can take advantage of these two in order to create a clean exploit. Our exploit will take advantage of the fact that we can control the flow of the program (remember that ret tried to jump to an offset in our pattern?) and we’ll try to execute system("/bin/sh") to pop a shell. To leak the real address of puts we’ll use a technique called ret2plt. The Procedure Linkage Table is a memory structure that contains a code stub for external functions that their addresses are unknown at the time of linking. Whenever we see a CALL instruction to a function in the .text segment it doesn’t call the function directly. Instead, it calls the stub code at the PLT, say func_name@plt. The stub then jumps to the address listed for this function in the Global Offset Table (GOT). If it is the first CALL to this function, the GOT entry will point back to the PLT which in turn would call a dynamic linker that will resolve the real address of the desired function. The next time that func_name@plt is called, the stub directly obtains the function address from the GOT. To read more about the linking process, I highly recommend this series of articles about linkers by Ian Lance Taylor. In order to do this, we will find the address of puts in both the PLT and the GOT and then call puts@plt with puts@got as a parameter. We will chain these calls and send them to the program at the point where scanf is expecting our input. Then we’ll return to the entrypoint for the second stage of our exploit. What will happen is that puts will print the real address of itself — magic! For writing the exploit we will use pwnlib framework which is my favorite python framework for exploitation task. It is simplifying a lot of stuff and making our life easier. You can use every other method you prefer. You can read more about pwntools in the official documentation. We need to fill in the addresses of puts@plt, puts@got, and the entry point of the program. Let’s get back to radare2 and execute the following commands. The # character is used for commenting and the ~ character is radare’s internal grep. sym.imp.puts and reloc.puts are flags that radare is automatically detect. The command ie stands for Information Entrypoint. I executed it 3 times to show you how the address of puts has changed in each run. Therefore we cannot predict its address beforehand. Now we need to find the offset of puts in libc and then calculate the base address of libc. After we have the base address we can calculate the real addresses of system, exit and "/bin/sh" using their offsets. Please notice that in this part of the article, my results would probably be different then yours. It is likely that we have different versions of libc, thus the offsets won’t be the same. First we need to find the offset of puts from the base address of libc. Again let’s open radare2 and continue executing until we reach the program’s entrypoint. We have to do this because radare2 is starting its debugging before libc is loaded. When we’ll reach the entrypoint, the library for sure would be loaded. Let’s use the dmi command and pass it libc and the desired function. I added some grep magic (~) to show only the relevant line. Please note that the output format of dmi was changed since the post been published. Your results might look a bit different. You can view more options if you’ll execute e search.in=? . To configure radare the visual way, use Ve. | /h[t] [hash] [len] find block matching this hash. See /#? Amazing amount of possibilities. Notice this /R feature for searching ROP gadgets. Sadly, we are not going to cover ROP in this post but those of you who write exploits will love this tool. We don’t need something facny, we’ll use the simplest search. After that we’ll find where in this current execution libc was loaded at (dmm) and then we’ll calculate the offset of "/bin/sh". 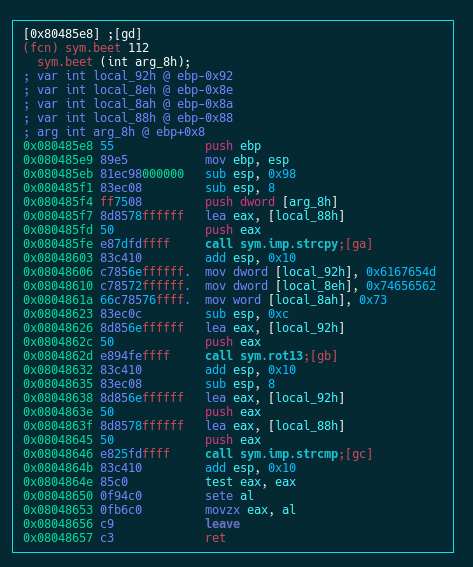 We found that the offset of "/bin/sh" from the base of libc is 0x167768. Let’s fill it in our exploit and move to the last part. The second stage of the exploit is pretty straightforward. We will again use 140 bytes of padding, then we’ll call system with the address of "/bin/sh" as a parameter and then return to exit. Remember that we returned to the entrypoint last time? That means that scanf is waiting for our input again. Now all we need to do is to chain these calls and send it to the program. Here’s the final script. As I mentioned earlier, you need to replace the offsets to match your version of libc. [+] Here comes the shell! Here the second part of our journey with radare2 is coming to an end. We learned about radare2 exploitation features just in a nutshell. In the next parts we’ll learn more about radare2 capabilities including scripting and malware analysis. 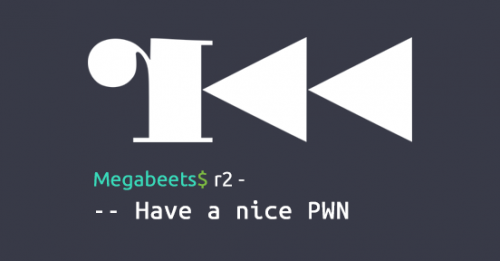 I’m aware that it’s hard, at first, to understand the power within radare2 or why you should put aside some of your old habits (gdb-peda) and get used working with radare2. 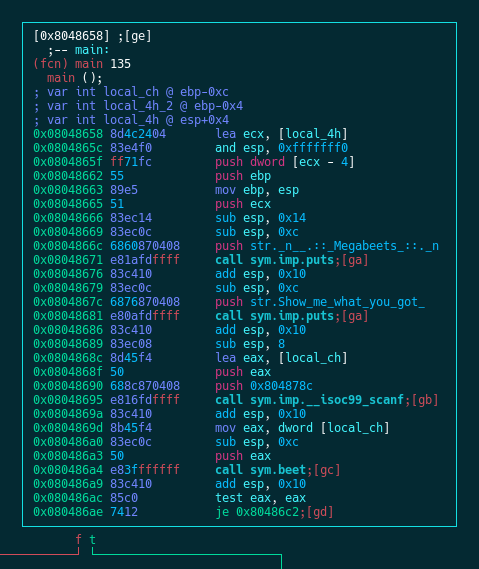 Having radare2 in your toolbox is a very smart step whether you’re a reverse engineer, an exploit writer, a CTF player or just a security enthusiast. Here’s a list of the commands I mentioned in this post (and a little more). You can use it as a reference card. Check this post on radare’s blog to see more commands that might be helpful. sweeet! waited for this email to come like forever. even better than the previous one imo. Thanks Branden! Probably a bug, I’ll take a look at the source code in the next few days and see what the problem is. Your solution is the old fashioned way load rarun2 profiles. Good job! “r_config_set: variable ‘gdb.profile’ not found” when r2 was starting. A couple of people are complaining about it and I’ll check radare’s source-code and search for the bug. The error that had thrown at you is very weird since you can see it says gdb.profile and not dbg.profile. Probably an issue as well. -- Hang in there, Baby! -- Your project name should contain an uppercase letter, 8 vowels, some numbers, and the first 5 numbers of your private bitcoin key. I tried running the process as root and disabling kernel hardening to ptrace through /proc/sys/kernel/yama/ptrace_scope -> 0 without any luck. I’ve been waiting for your second blog post for a long time, nice to see it finally came out! Thanks for the impressive article about radare2 and RE, it helps me a lot! which means that the offset of AKAA should be 29. After double checking on this, I realized that if reversed the byte order then evrything make sence again(AAKA is at offset 28). But in your case then it should be AvAA and it’s offset is not 140 anymore(in fact it’s 141). Could you please enlighten me where’s wrong? You’re are right about the endianness, 0x41417641 is actually the part of “AvAA” in the sequence. When radare2 executes wopO it checks for the location of the substring in its big-endian format. i.e it check where 41764141 (AvAA) is located in the substring. So it’s indeed at offset 140. I updated “AAvA” in the article to “AvAA”. I download Radare2 on Feb 17, 2018. Could you show me step by step? Hi Alex, sorry for the late response. I just noticed your comment today. Sorry about it. Please clarify what is not working for you. From the error you posted, it seems like you can’t run the binary. Please make sure you’re using the right operating system, as well as given the binary executable permissions. I just changed the grep in order to clear noise. Anyway, you could have found the addresses without the need to grep. Hi kailu, thanks for the feedback. I just changed the grep in order to clear noise. Anyway, you could have find the addresses without the need to grep. Thanks Gergely! The command was changed in radare2 so now I updated it in the post. It seems you have in your DMI ~&GLOBAL but on my install (and on your install) it seems that not all of the libc symbols are global. 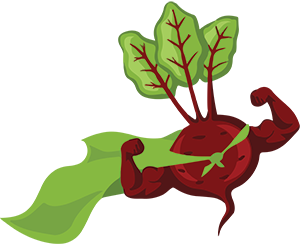 HI megabeets, thanks for the tutorials, they are great. I have a nooby question, and I would be glad if you can answer it. And i tried this way but it didn’t work. So I don’t know why we did not do that. If your payload fail and your shell close immediately. Thanks for this writeup, it’s VERY well written and a huge help for radare2 newbies. I found reloc.puts, not reloc.puts_20. It was at the same address as you had listed so I assumed it was the right one.